Most of Sri Lanka's majority ethnic Sinhalese are Theravada Buddhist. 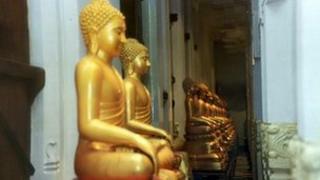 Mistreatment of Buddhist images and artefacts is strictly taboo in the country. The incident is alleged to have taken place at a temple in central Sri Lanka. Police spokesman, Ajith Rohana, told the BBC the French party had visited the laboratory to get pictures printed. The images were impounded after the owner of the photographic laboratory alerted police, but they were later posted on a Sri Lankan website. Last month there were reports that five Arabs visiting the island were arrested for distributing "literature insulting to Buddhism". In 2010 two Sri Lankan Muslim traders were given suspended jail sentences for selling keyrings containing an image of Buddha. That same year Sri Lanka denied a visa to the R&B star Akon, who had been due to perform a concert. It happened after public protests over one of his music videos which briefly showed scantily-clad women dancing in front of a Buddha statue. There is currently widespread excitement in Sri Lanka as the Kapilvastu Relics - believed to be bones of Lord Buddha - have been brought to the island from India for a two-week tour of temples.